In this episode I interview a practicing psychic. I ask her to answer questions about paranormal phenomena and what the basis of her belief is. 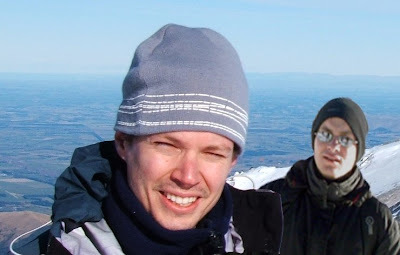 I am joined by good friend Ben (pictured at Mt Hutt in NZ with me), who I discuss this with – in terms of Thomas Gilovich’s book How We Know What Isn’t So – The Fallibility of Human Reason in Everyday Life. Here's the link to direct download: (47 mins & 22 mb) and you subscribe here: http://huntinghumbug101.podbean.com/feed/or by clicking one of the buttons below. Thanks to the American Bookstore – their coffee shop was closed but they let us bring in take away coffees from somewhere else anyway. Love those guys. Many major league baseballers have August birthdays. The TV show - The One. With skeptical judge from The Skepic Zone - Richard Saunders. My question on Yahoo Answers.